Here is our row!!! Don't you just love it? There are 2 color choices and the embroidery can be done by hand or with your machine's triple stitch. 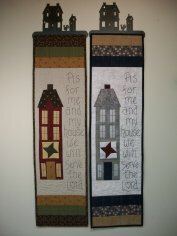 We also designed it as a stand-alone wall hanging with the Ackfeld Row X Row hanger or you can put it into a quilt. The Friendship Star quilt block is 3 dimensional. Our kit will be selling for $12.99. The start date is June 21! Due to circumstances beyond our control, our fall bus hop was cancelled. We are "beary" sorry!!! You never know though, we might have something else up our sleeves. Stay tuned!